I am so glad Farley does this. I love, love, love football season. I play fantasy football with the hubs and in a teacher-blogger league as well. I'm super proud of my Georgia Bulldogs and Atlanta Falcons.We watched an AWESOME Georgia win over Florida last weekend with some longtime friends, and I still can't believe our Falcons are 7-0. Any other football lovers out there? This time of year also makes me super-homesick. I am a family girl. Luckily, I married a family man. As soon as he is done peddling wine on Wednesday, we are headed to western North Carolina for a few days with my family. Do you Spotify? You should. I have about a bajillion playlists. You can "drag and drop" practically any song in the universe into a playlist you create and listen to it over and over. It's like iTunes and Pandora got married and had an amazing baby. Only you can't upload anything to your iPod. Other than that it's pretty magical. You should check it out. 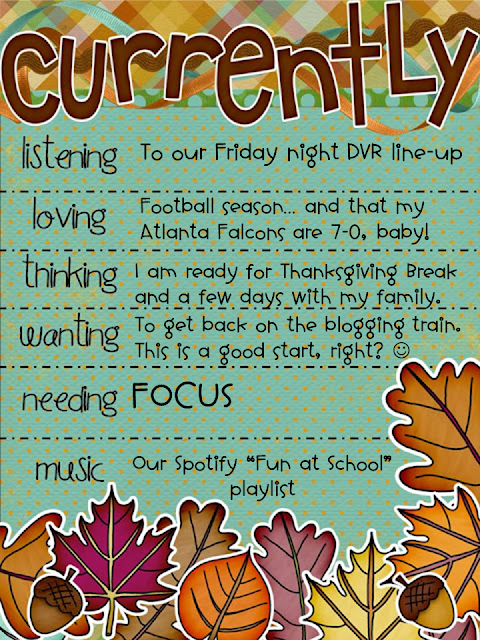 We have a "Fun at School" playlist I created with the kids that I use for transitions, brain breaks and just plain fun. We add to it every once in awhile - you can even find kid-friendly versions of current pop songs on there - when they have a request or I come across something I think they'll like. Alright. That kitchen is screaming my name and nothing would make me happier than to see it clean when I wake up in the morning. I'll be back later this week with some fall freebies and (hopefully) and old new unit to tell you about! I'm right with you! I need to focus more lately! It's gotten bad! Hopefully you will be posting more regularly now! I need to check out Spotify! That sounds awesome. I can also relate to needing focus!! I believe football is its own season but I am a Bears fan. We are at the top of the league... YIPPEEE!! I do the same thing with draft posts... I have about 5 or 6 and they have been their for months and I keep pushing them back. Who knows when they will appear! So glad I am not the only one. Never heard of spotify... but I will give it a whirl!